SAN JOSE, Calif. – In many large data centers, “rack and stack” has yielded to “rack-n-roll,” with vendors shipping fully-populated racks of servers for rapid deployment. It’s a process that is now assisted by robots. To meet growing demand for its pre-loaded racks, Supermicro has opened a new rack integration facility in San Jose that will boost its production capacity by 600 racks per month. The new facility, known as Building 21, uses robotics to move fully-loaded racks from room to room, and is powered by fuel cells from Bloom Energy. The use of robotics and renewable energy at Supermicro reflects how hyperscale computing is bringing change to the data center supply chain, which is adapting its practices to deliver plug-n-play servers in larger volume, so they can easily roll into a data hall and be brought online. Data Center Frontier recently got a look inside Building 21, where Supermicro manages the end-to-end process of how a server is built, tested and delivered to customers. The 182,000 square foot building houses production lines, testing and burn-in facilities, and the new rack integration area. 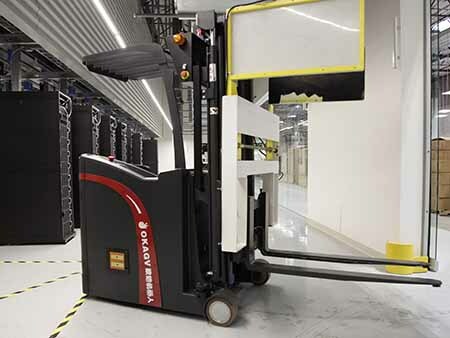 That’s where racks are filled with servers and then handled by robotic Automated Guided Vehicles (AGVs), which lift the racks and move them into a fully-automated facility where up to 60 racks at a time can undergo quality testing. Supermicro says the use of robotics improves efficiency, provides cost savings, and reduces the potential for injury or human error while handling the extremely heavy racks, which can house millions of dollars of equipment. One sign that the Supermicro facility is different is the presence of a series of reflective sensors mounted on the walls, which help the AGV robots determine their position as they glide slowly through Building 21. The AGVs resemble unmanned forklifts, with arm-like paddles that can grasp and secure a rack as the unit moves about the facility. The rack integration facility is located at the end of the server assembly line at Building 21 (more on that in a bit). Once the servers are assembled and undergo an initial round of testing, Supermicro staffers carefully load them into racks – a process known as “rack and stack” – by inserting them into slots in the rack chassis. Then comes the “cable and label” process to hook up each server’s power and network connections. Once the servers are racked, the AGV will move the full racks of servers around the facility, first to a special room for a final round of testing, and then to shipping. The AGV is programmed to retrieve a populated rack of servers from a specific position in the rack integration room, and move it to a designated spot inside the rack testing area. The AGV has a proximity sensor to avoid bumping into walls or other objects, is aware of each rack’s height and weight, and can adjust loads to balance their center of gravity. The rack “burn in” room supports up to 60 racks and 3 megawatts of electrical load. Once the racks roll into place, they are connected to an overhead power busway, as well as one of the many types of network connections available. 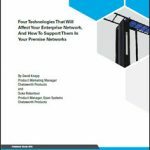 Raspberry Pi controllers with wifi connections handle software installations, customizing servers in each rack based on pre-defined customer specifications. 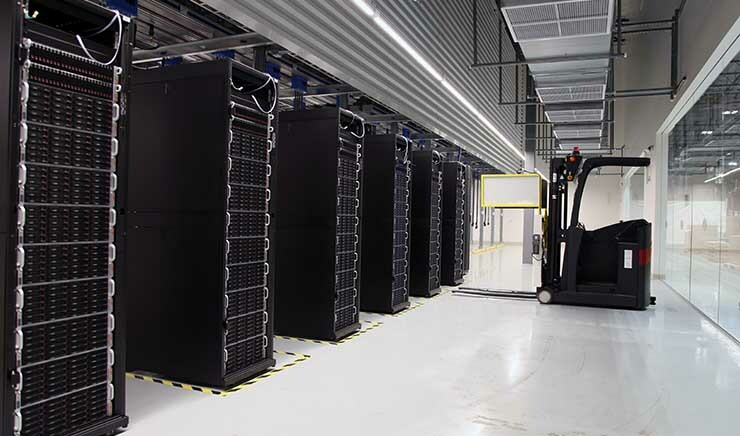 The fully-loaded racks then undergo “burn-in” testing, where the systems run for an extended period of time, typically six to 12 hours or more. Once the testing is complete, the AGVs move each rack onto a custom crate equipped with springs and dampers to absorb shocks and isolate movement as the rack is shipped to its final destination. Supermicro offers a service to manage the truck ride, and can either drop off the rack at a loading dock or install it into the data hall. 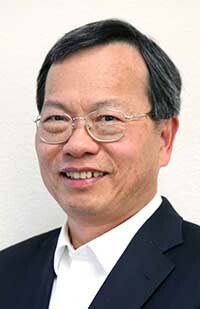 Supermicro was founded in San Jose in 1993 to commercialize Charles Liang’s designs for motherboards. It now offers a full line of servers, storage and networking devices, along with a components business. “We started with the server, then the chassis, and then the complete solution,” said Liang. Supermicro has built its business on rapidly deploying the latest processors in its servers, working closely with Intel and other chip vendors. It can customize orders for large users in high performance computing (HPC), hyperscale and cloud markets, where companies have rapid refresh cycles and covet the latest and most efficient designs. Supermicro offers products in a wide variety of form factors. Research firm IDC ranks Supermicro as the third-largest server vendor, trailing only Dell and HP (and tied with Lenovo, Huawei and Inspur). Supermicro shipped 1.2 million units in 2017 to more than 800 customers, with revenue exceeding $2.5 billion. 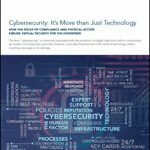 The company has a hybrid model, as it builds systems for large OEM server vendors and systems integrators, also sells directly to end user customers. Liang is proud of the fact that Supermicro makes most of its servers in the United States. 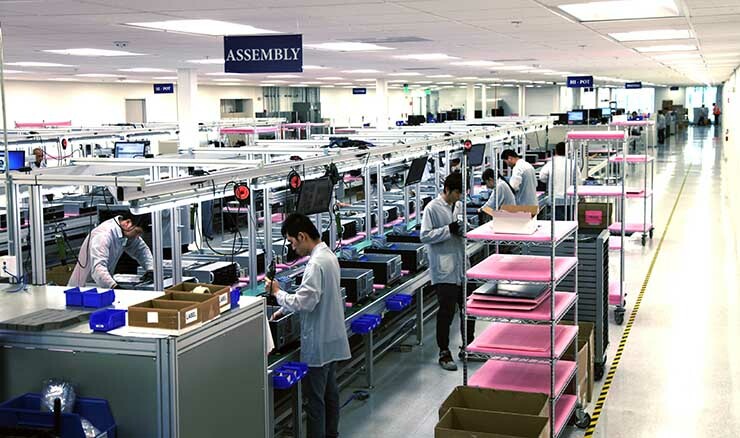 It has added factories in Taiwan and the Netherlands, but has the bulk of its operations in San Jose, where 2,000 workers fill more than 2 million square feet of space across 10-plus buildings. That includes its new Green Technology Campus, a 36-acre property previously owned by the San Jose Mercury News. That’s the home for Building 21. 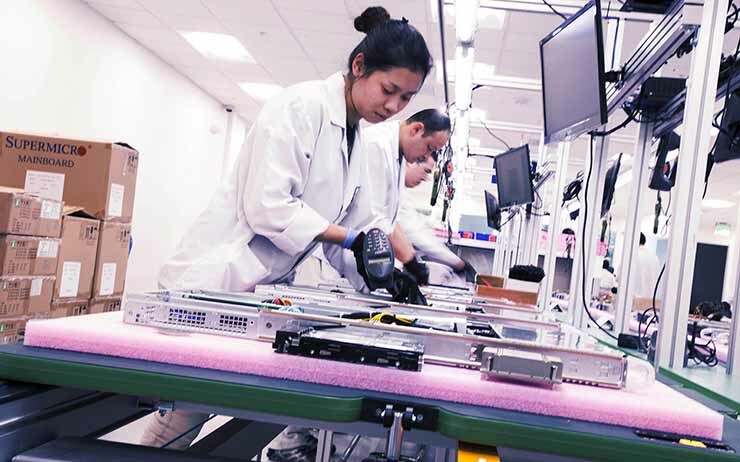 As you enter Supermicro’s assembly line area in Building 21, the first thing you notice is the workers wear special smocks to eliminate electrostatic discharge, which could damage the electronic components. There are four assembly lines in each production room, with stations every few feet where Supermicro staffers install components. Each technician has a tray of components behind them, and a screen above their station displaying a visual guide to the specific chassis and modules and how they are to be installed. Stations are equipped with power screwdrivers and other tools hanging from an overhead power bus. Each screwdriver is set to a specific torque level for the different parts and materials (some metal, some plastic, for instance). The torque is checked twice a day, and adjusted as needed. Stations that handle processors are equipped with custom tools, developed in cooperation with Intel, to remove and install delicate server chips. Supermicro says it uses only permanent staff instead of temporary workers, with an average tenure of about three years of experience. The company believes experienced technicans are essential to quality control. As the server moves down the conveyor belt, the components are scanned at each station, providing full insight to the production flow. As servers continue down the conveyer, they undergo a series of tests to validate safety and performance. The assembly process usually takes 20 to 30 minutes, plus another 10 to 20 minutes for testing. Once the initial test scripts have been run, the “bare bones” servers go down one fork of the conveyor to be packed and shipped. The rest of the servers go for burn-in testing, and then sent for packing and shipping, or to the rack integration facility. Supermicro has five server assembly facilities on its San Jose campus, which can manufacture up to 63,000 servers a month. Global facilities in Taiwan and the Netherlands can manufacture another 18,000 systems per month between them. Just outside Building 21 sites a bank of Bloom Energy Servers, which provide enough power to support the entire rack integration facility. The campus has a total of 3 megawatts of Bloom units, which use solid oxide fuel cell technology that converts fuel to electricity through an electro-chemical reaction, without any combustion. Bloom says that its on-site fuel cells offer “better electrons” by making more efficient use of fuel than coal-fired power plants, eliminating power loss during distribution, and sharply reducing emissions. The Bloom servers run on natural gas, and are configured to maintain critical operations during grid power outages. Supermicro estimates that the use of the fuel cells will reduce their energy costs by as much as $8 million over the next 10 years. Liang is a big believer in the power of efficiency and density to reduce the environmental impact of IT systems, and sees the investment in the Bloom boxes as part of that commitment. Liang’s focus on sustainability is deep, and personal. He recalls taking his children to see “The Day After Tomorrow,” a 2004 film about a global disaster caused by climate change. His kids challenged Liang to consider ways to address climate change, and he began to look at the energy profile of Supermicro’s IT equipment. He immediately focused on the poor energy efficiency of server power supplies. Unimpressed by commercial power supplies, Liang created an in-house team of power supply engineers to create more efficient power supplies. The company’s emphasis on sustainability extends to its marketing and hospitality, including the bright green ties Liang shares with visitors. “Supermicro is green!” he says with a smile. Great article, thank you Rich!